DepEd releases 2014-2015 ALS Accreditation and Equivalency test results (List of Passers) - Balita Boss! The Department of Education (DepEd) released the official results of 2014-2015 Alternative Learning System Accreditation and Equivalency (ALS-A&E) paper and pencil test (PPT) on May 26, 2015. The examination was conducted on December 2014 and on January 2015, administered in 17 regions nationwide by the Bureau of Alternative Learning System (BALS) of DepEd. 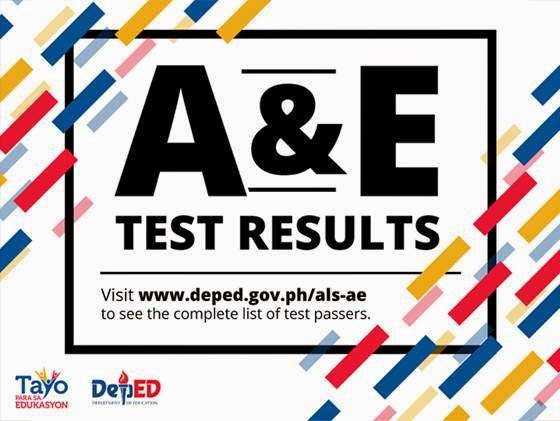 According to DepEd, passers of the A&E Test will be given a certificate/diploma, certifying their competencies as comparable graduates of the formal school system. Passers are qualified to enroll in secondary and post-secondary schools.